At SWI, we work hard to source top-quality fabric and create innovative designs, but none of this matters if the fit of your child's school clothing isn't right. We want to help you get the best possible fit and look for your child's new kit. After all, your child deserves better than itchy fabrics, baggy sleeves and trailing hems. All of our garments have been designed to stand the test of time, but we also want to help your child look good and feel great too. When buying school clothing it can sometimes be hard to keep up with the growth spurts. That’s why we always recommend you use up-to-date measurements before you place an order with us. 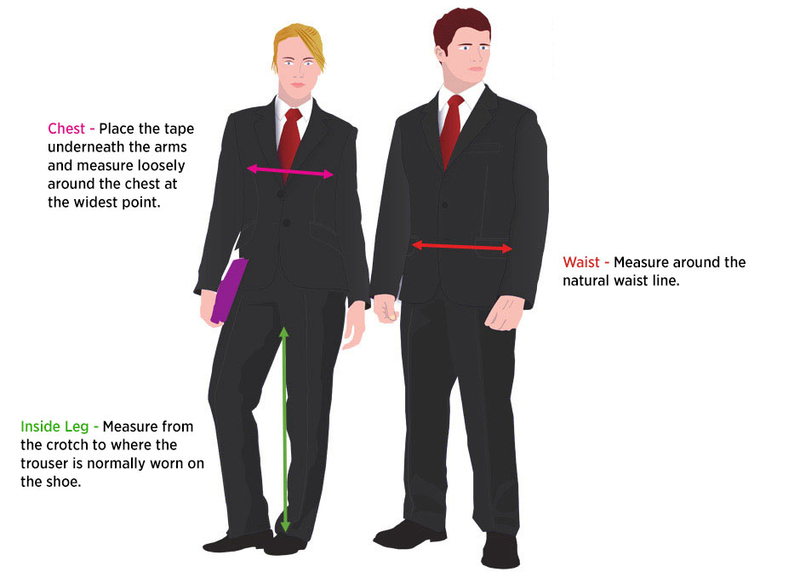 If you need a little guidance before you take your child's measurements, take a look at the helpful diagram below. Our schoolwear is available in a wide range of sizes and has been designed for best fit. For example, if your child measures 28 inches, then that is the size that we recommend that you buy. If your child is between sizes, then we recommend that you buy the next size up. Measurements such as height are a better guide than age when choosing the correct size, so if your child is taller than average, it is advisable to order the next size up in tops or trousers. If you have any questions or concerns about the sizing of our garments, don't hesitate to get in touch with the SWI team.